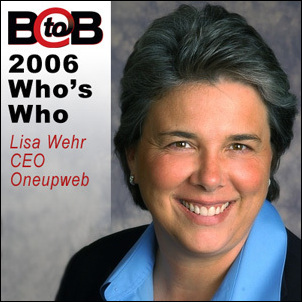 Oneupweb, the trusted leader in search engine optimization and online marketing, today announced that its CEO and founder, Lisa Wehr, has for the third consecutive year, been named to BtoB Magazine’s Who’s Who List, an annual salute to the most influential executives in the business-to-business marketing community. Wehr is the first individual to be so recognized three times in the Search Marketing category. Wehr is the founder of Oneupweb, a pioneer in natural and paid search optimization. This year the company added new integrated online marketing services including online market research, website usability and podcasting services. In addition to Wehr, this year’s search marketing winners include such influential industry leaders such as Tim Armstrong, VP of Advertising Sales at Google; Gerry Campbell, VP and General Manager of Search & Navigation at AOL; Wenda Harris Millard, Chief Sales Officer Yahoo! Search Marketing; David Jakubowski, General Manager MSN Search; and James Speer, VP Marketing and Products IAC Ad Solutions, Ask.com. It’s been a remarkable year for Wehr and Oneupweb. In 2005 the company moved into a new facility increasing their space four-fold, and was honored as Best Search Engine Firm by ClickZ. In April of 2006 Michigan Governor Jennifer Granholm and the Edward Lowe Foundation named Oneupweb as one of Michigan’s 50 Companies to Watch. BtoB Magazine has described its list of Who’s Who as, “… the executives who lead their organizations through good times and bad. They're the ones who help establish the best practices in business marketing for their respective industries. … Nominations came from readers, corporations, industry experts and our editorial staff. …” BtoB Magazine delivers timely editorial on all disciplines of business-to-business marketing. Published monthly by Crain Communications Inc., BtoB provides more than 45,000 subscribers with the information and analysis they need to develop a winning integrated marketing strategy for their companies. For more information on BtoB’s Who’s Who 100 visit http://www.btobonline.com. The trusted leader in search engine optimization and marketing, Oneupweb creates integrated online marketing plans that include natural search engine optimization, paid search marketing, podcast production and media planning, online marketing research, marketing analytics, online advertising creative and online media services. Clients include Unisys, Maritz, Schwan’s, Silkflowers.com and Imagistics, among others. Oneupweb was named one of the 2006 Michigan 50 Companies to Watch and is the only two-time winner of the prestigious ClickZ Best Search Engine Marketing Vendor Award. And company founder and CEO, Lisa Wehr, has been named an Ernst & Young Entrepreneur of the Year and to BtoB Magazine’s Who’s Who List twice and also recognized as a Leader & Innovator by Lawrence Technological University. The company publishes a monthly newsletter entitled Online Marketing Brief and blog StraightUpSearch. Oneupweb is a privately held company located in Michigan. For more information on Oneupweb, please contact 231.256.9811 or visit Oneupweb.com.